Just this past weekend, I jumped out of a plane from 4,000 meters above the ground with some of my best friends. Just before that day, I came back to the United States from interning at Mason Williams in London, England. After getting a chance to think about both experiences, I began to realize how similar they were. Before arriving in London, I did not know what to expect and became really nervous. Traveling thousands of miles away from home and only contacting the Mason Williams team via phone or email made for a lot of questions. However, when I finally got to the office on my first day, I was welcomed with a cup of tea and a group of people eager to answer all of the questions I had. My experience was beyond what I could have imagined. As an intern at Mason Williams, I worked alongside Account Executives, Account Managers, Directors and the Managing Director as a valuable member of the team. Even though I was an intern with an American accent, I quickly gained exposure to public relations by working on coverage reports, client meetings, press releases, potential client research and so much more. I even got to attend an all-day press event that included taking apart a £1,900 grill in the middle of an elevator so it would fit. Every workday was packed with an incredible mystery of what would come next. At the end of my time in London, Rita Rowe gave me the cork from the champagne bottle shared by our office during my goodbye toast. There was a coin stuck in it as well. She told me of its significance and I was quickly overwhelmed by how bittersweet the moment was. This was such a small gesture, but it holds a powerful meaning. This embodies my time at the company: such a short amount of time, but a very meaningful experience. 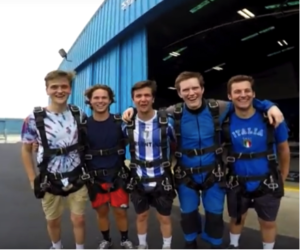 Skydiving held this same significance in my mind because even though I was airborne for only less than a minute, experiencing it with an awesome team of people made me feel like anything was possible, just like at Mason Williams. Mason Williams works on behalf of dozens of clients but because of the staff, so much is possible. The tangible takeaway can be as small as a cork with a coin in it, but as powerful as jumping out of a plane with ones’ best friends. At Mason Williams we are passionate about our work. We promise our clients outstanding results and we deliver.